Get ready for Mega from the flamboyant Kim Dotcom. 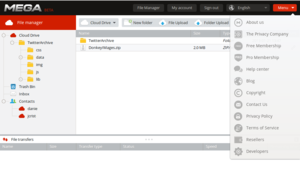 The Internet entrepreneur and accused digital outlaw recently launched Mega (short for Mega Encrypted Global Access), a new file storage and sharing service that features 50GB of free storage. Mega is just one component of what Dotcom and his team hope will be a suite of online encrypted services from Mega Ltd. including email, voice calling, instant messaging, and video streaming. For now, Mega is a Web-based end-to-end encryption file storage service that encrypts your files in the browser before uploading them to Mega's servers. 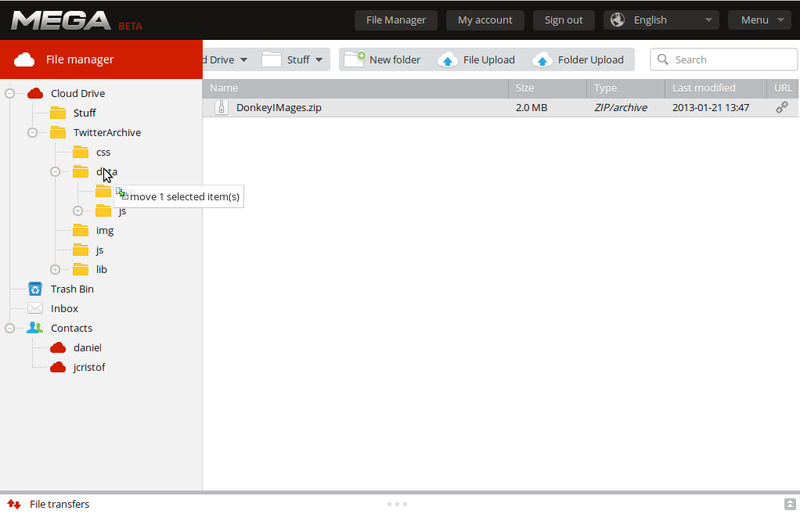 You can also use Mega to share files with others, and add other Mega users to your contact list for easy drag-and-drop sharing. I've been playing around with Mega recently, and the service is pretty slick. However, it also appears that a few lingering bugs hamper overall functionality of the service. Let's take a look. Mega's Browser instructions (click to enlarge). 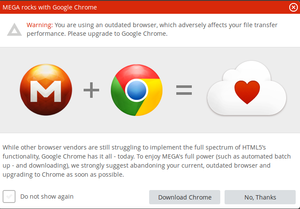 Mega says it "pushes the browser to its limits" thanks to the technology it uses for encryption and file transfers. 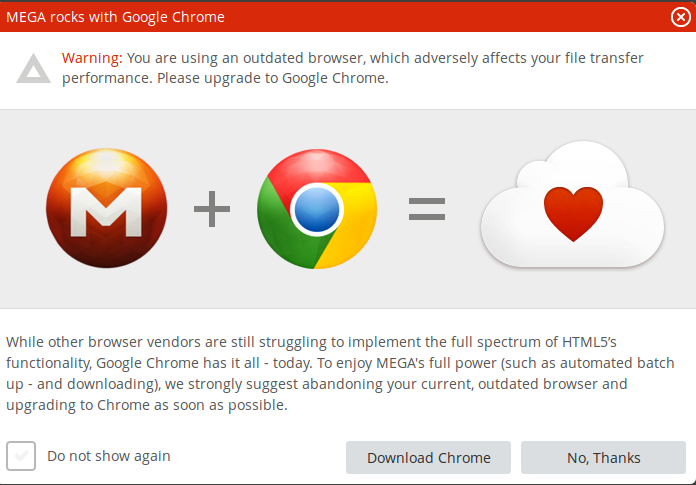 All the current versions of the major browsers (IE, Safari, Firefox, Chrome, and Opera) are supposed to be compatible. The problem is all except one work very poorly. Use of Internet Explorer 10, for example, has a bug that forces you to close and reopen your Mega tab every hundred megabytes or so worth of uploads, according to Mega. For best results use Google Chrome; Mega says its only deficiency is lower-grade text rendering. Chrome also has the added advantage of allowing you to upload folders with one drag-and-drop action. Mega's start screen (click to enlarge). To get started, click "Register" at the top right-hand side of the page. Then enter your name, email address, and a password. Make sure you use a particularly strong password with sufficient length and random characters, since your password also serves as the master encryption key for your account. You will then have to click on a confirmation link you receive via email before you can start using the service. 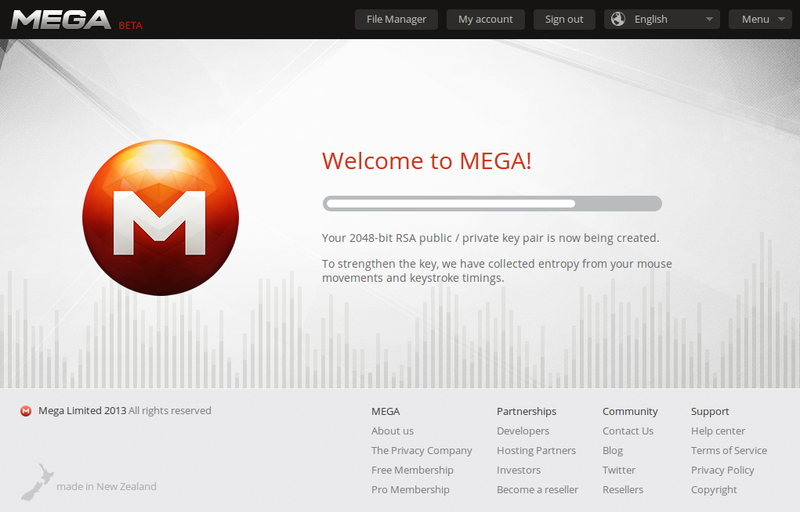 Mega creates an encryption key for file management. Once you confirm and sign in, Mega will create a 2048-bit RSA public/private key pair for the service's encryption features. Manage files at the dashboard (click to enlarge). After that's done, you will arrive at your file manager dashboard where you can upload and download files, share public links to files, and share files with other Mega users. At the far right is a drop-down menu aptly titled "Menu" that contains links to Mega's blog, pricing for Pro accounts, help, terms of service, and other informational links. 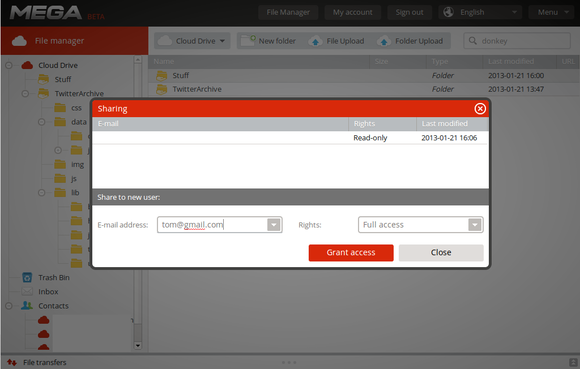 On the left side is the Cloud Drive showing all your uploaded files, and navigation links to the trash bin, your inbox, and contacts. To add a contact, just click on the contacts section and click "Add contact" at the top of the page. Once the person signs up for Mega they will be automatically added to your contacts list. One of the handier features in Mega is that you can share files with other Mega users by dragging and dropping a file to their name in your contacts section. Mega plans to add Instant Messaging to the service so you will be able to do more than just send and receive files with your contacts. If someone shares a file with you, it will pop up as a notification in your Mega inbox. You can then decide what to do with the file. Adding files from your desktop is a pretty straightforward process. You can either drag and drop files right onto your file manager, or you can click the upload buttons at the top of your cloud drive. File uploads are monitored in the lower half of the screen. In my tests, file uploads were a little slow, possibly because of the encryption process, and it took a few minutes before the file was listed on my cloud drive even after the upload was complete. Complete folder uploads are also available and are added the same way files are, but only Chrome users can add folders from their desktop. File management functions (click to enlarge). Right-clicking a file shows you several menu items, including the capability to download a file; get a link; rename a file; move, copy, remove, and reload. You can also drag and drop your files into new folders. Similar to Windows Explorer, you can expand folders and subfolders in the left-hand column and then drop files directly into subdirectories. File-sharing options (click to enlarge). You can share a file with anyone, regardless whether they have a Mega account. To share a file, you either right-click on the file and select "Get link," or you can click the link icon to the far right of the file name. Either method will open a window that shows you an extremely long link to your file that includes a secret key (a string of numbers and letters). Mega URLs are composed like so: https://mega.co.nz/#!FileAddress!SecretKey. For someone to access this file, they will need both the file's URL and the key. Mega warns that if the secret key is exposed, anyone can access and download your file. If you are concerned about keeping your files private, Mega suggests you should not share the key through insecure channels such as plain email. To hide the file key, just uncheck the "File key" checkbox and then copy the file's URL to the clipboard. You can then send the link to the file via email, and then send the key in an encrypted email or IM session. Because files and folders are encrypted on Mega's servers, the site cannot supply thumbnail previews of images or video, offers no online streaming component for video and audio files. Sharing a folder is a little different from sharing a single file, and you can share folders only with other Mega users. If you share a folder with someone who is not a Mega user, they must sign up for an account in order to access it. Folder-sharing options (click to enlarge). To get started, right-click the folder and select "Sharing." You will then get a pop-up window where you can see a list of users with whom you have already shared the folder, and can add new users. To add someone, enter their email address and choose the level of access you want them to have, which ranges from read-only, read & write, or full access. Once a folder is shared, the folder icon in your main file manager dashboard will have a hand underneath it to indicate it is a shared folder. Folders that others have shared with you will appear in a list under your friend's name in the contacts section. Let's say Tom@gmail.com shares a file with you. The shared folder will appear under Tom's email address in your contacts section where you can, depending on your level of access, add or delete files. This could be a great feature for group collaboration on a set of files, or to share a photo folder with family and friends, but sharing is where Mega starts running into problems. I came across many bugs during my Mega tests even while using Chrome. The most obvious problem is an SSL encryption error that denies access to the site or specific pages in the site. A few times I couldn't even open the site's help page because of the SSL issue. You can usually fix the problem by refreshing the page once or several times, but in some cases you may have to close the page and start over. File sharing is also problematic. Sending files and folders to others is no problem, but once someone receives the file, they may have problems accessing them. I shared a file with one of my dummy accounts for testing as well as to a colleague's account. In both cases the file was "Temporarily unavailable" for download, even up to an hour after the file landed in the other Mega account. Kim Dotcom at the Mega introduction. Mega also says that you can stop and restart interrupted uploads and downloads as long as you don't close your current browser tab. In my tests, this didn't appear to the case. Interrupted uploads and downloads are supposed to restart automatically. But when I pulled the wired connection out of my PC and switched to Wi-Fi, that didn't happen. The uploads just stalled and I eventually had to cancel them and restart. Perhaps the worst bug of all, however, is one that prevents you from signing in to Mega. This caused me to lose access to a dummy account. Even though I entered the password correctly, Mega kept telling me there was a log-in error. I thought I might have forgotten my password, until a colleague said the same thing happened to him. That's a big problem, since Mega does not have an account recovery process. Part of Mega's setup is that all encryption takes place in the browser and the company doesn't have access to your encryption keys, preventing them from knowing the content of your files. So if you lose access to your account by forgetting your password, which is also your master key, you're out of luck. If you decide to use Mega, whatever you do, do not, I repeat, do not rely on Mega as the sole location for any of your files. You absolutely must have backups on your local hard drive, on another cloud service, on a thumb drive, on Gmail, anywhere. The reasons for this should be obvious for anyone who keeps up with tech news, but in case you're new here, let me spell it out for you. Kim Dotcom and his Mega co-founders are also the brains behind MegaUpload, which was shut down by U.S. authorities last January. Dotcom and his cohorts were charged with criminal copyright offenses, among other charges, and are currently facing extradition from New Zealand to the United States. MegaUpload, and its complementary services such as Megavideo, were widely seen as havens for pirated content. It's not clear if Mega will share the same fate as MegaUpload, but it's pretty much a given that law enforcement will be watching Mega very closely. If, one day, Mega is shut down in a similar manner to MegaUpload, all your files could be gone for good. Mega may be a useful service, but there is no way you can trust it as the sole repository of your files on a long-term basis. Overall, Mega could be a very good service one day; however, several bugs need to be fixed and, considering Kim Dotcom's infamous reputation, you would be crazy not to have copies of your Mega files stored elsewhere. For now, I would not recommend paying for Pro accounts until some of the service's problems are solved. Once they are, however, you can purchase three different Pro accounts. Pro I provides 500GB of storage for $10 per month. Pro II includes 2TB of storage for $20 per month, and Pro III offers 4TB storage for $30 per month. 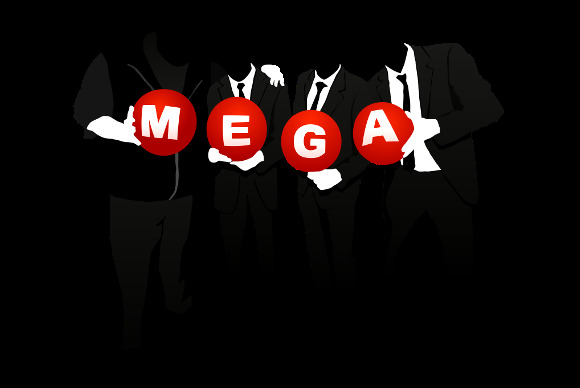 Dotcom and his friends have big plans for Mega. Feature enhancements slated for the coming months include mobile apps for multiple platforms; calendar, word processing, and spreadsheet Web applications; instant messaging; and desktop file mounts for Windows, Mac OS X, and Linux. Let's just hope the team fixes Mega's bugs before adding new stuff.